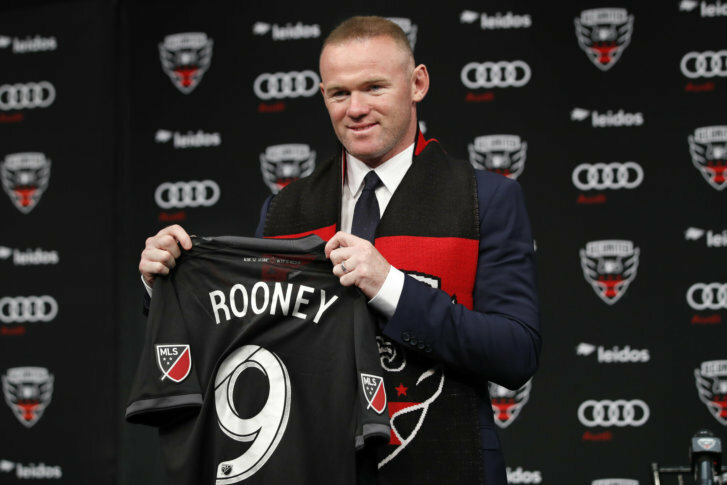 With Audi Field set to open in less than two weeks, D.C. United introduced the biggest acquisition in team history, Wayne Rooney. WASHINGTON — A day that has been rumored, discussed and debated finally arrived in D.C. Monday, as Wayne Rooney was officially announced as the newest member and biggest signing in the 24-year history of D.C. United. Flanked by team officials and D.C. Mayor Muriel Bowser — who declared Monday Wayne Rooney Day — Rooney said mostly all the right things you expect out of a player who, at 32, is a seasoned veteran of media hordes much larger than the several dozen tucked into the Newseum for his introduction. Team President Jason Levien certainly didn’t pull any punches when discussing the impact he believes Rooney will have on soccer in Washington. “This is really a seminal moment for our organization and, we believe, for our District,” said Levien. The signing obviously dovetails with the opening of Audi Field on July 14, which explains Bowser’s presence. Her office helped to work with D.C. United on the long-awaited construction of their new Buzzard Point home. “They deserve a lot of credit for having a vision for our team, for soccer in D.C., for Audi Field, and I did not know they had Wayne Rooney up their sleeve,” said Bowser. The mayor may have been the only one surprised by the actual signing, though. It has been rumored since last summer, and even the process that led to Rooney’s eventual transfer — which will become official on July 10, just in time for the opener at Audi Field July 14 — was months in the making. Rooney is the all-time leading goal scorer for both England (53 goals) and Manchester United (253). However, while his high-profile signing may be a good first step toward a more-competitive D.C. United squad, Rooney doesn’t seem to be under any illusion that he can single-handedly turn the club around. The Black and Red have played as many as five fewer games than some other MLS teams, due to a back-loaded schedule to accommodate the new stadium opening. They also have played all but two of their 13 matches on the road so far. Nevertheless, they sit with just 10 points, the lowest total in the league and 13 back of a playoff spot as they head to L.A. for a match Wednesday without Rooney. He will begin training with them for the first time on Friday. It’s been a whirlwind introduction to the city for Rooney since he landed at Dulles International Airport Thursday afternoon. Rooney said he appreciated and never expected the fan turnout that welcomed him, and that he felt D.C. fit what he was looking for in a city when coming to America. Perhaps Rooney’s biggest adjustment in D.C. will be to the heat. After playing in England his entire career, he was introduced on a day when the heat index in Washington was pushing 110 degrees. He said he was worried about breathing in the hot, humid air, but early results have been positive. “Of course I’ll have to adapt and eventually get used to it, but it’s been OK so far,” he said. Now, he just needs to get himself into ready shape for the opening of the new stadium, just a week from Saturday.